Isn’t this cheerful? This is an aura sketch I just did for a client. 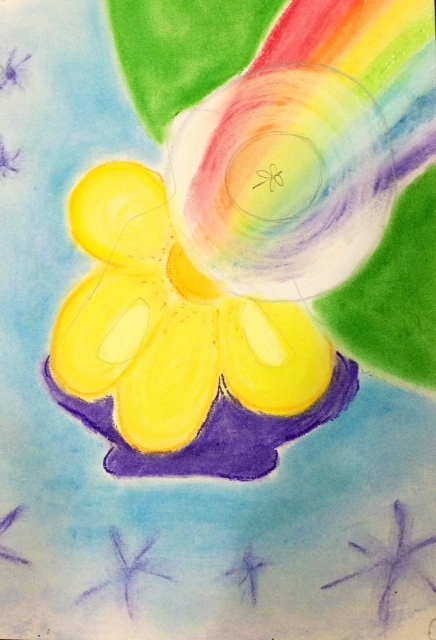 The rainbow was coming out of (or into) her heart chakra. Inside the rainbow was an ’empty spot’, and inside of this was a dragonfly, helping my client see though illusions and access different realities (perspectives/experiences). The dragonfly was helping her to keep the space around her open, rather than allowing people to mesh in too closely. The blue sky represents this clear open space. Around the empty spot was another circle. This made me think of ripples and a magnifying glass. Even the smallest changes can have profound effects that ripple into into the larger world around us.